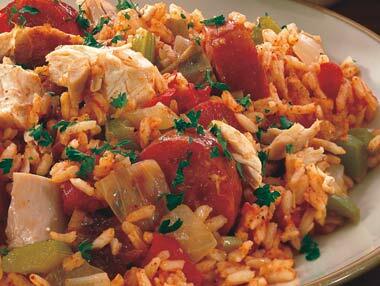 Chicken Sausage Jambalaya: a taste of the bayou in your own home. Thick chunks of trim, chicken breasts get mixed with mild Italian sausage, yellow rice and spices for a culinary adventure. Can be ready in 60 minutes using all fresh ingredients (no packaged spice blends here!). You control the sodium and the heat! We use Mild Italian Sausage if we are serving it to our daughters. For an adult meal, you may wish to use Hot Italian, or Smoked Kielbasa. To make this meal healthier, use brown rice and reduce the sodium level by omitting the teaspoon of added salt and use No Sodium Chicken Broth. Only YOU will know the difference! Chicken breast, boneless, skinless, cut into 1 1/2" chunks - 3/4 lb. Italian Sausage, cut into 1/4" slices - 3/4 lb. Mix Turmeric with White or Brown Rice. Follow instructions on package to cook rice. 1. In large/huge sauce pan, heat 2 Tbsp olive oil or butter. Cook Chicken pieces until brown on all sides and cooked half way through - about 20 minutes. Remove chicken from pan. 2. To the same pan, add Onions, Green Peppers, Celery, and Garlic cooking slowly until onions are tender. 3. Add sausages and cook for 10 minutes. 4. Return chicken and add Thyme, Oregano, Parsley, Cayenne, Salt, Pepper, Diced Tomatoes, and Chicken Broth, stir well, cover and cook for 30 min. 5. Remove cover from chicken and continue to cook until broth cooks down a bit. Add cooked rice and cook for only 2 or 3 minutes just allowing rice to absorb the broth and flavor but not stick to pan. 6. Serve in a large family-style bowl with crusty bread and a cold salad of greens.